One of the easiest ways to add softness and romance to a bedroom is to cover a headboard with fabric. The bed is usually the focal point in a bedroom, so adding extra softness by padding it with fabric brings about a luxurious feel and atmosphere. This project is quick, easy, and cheap…you just can’t go wrong! The only hard part is deciding on just one fabric, when so many gorgeous fabrics are available! 1. Drape the fabric over the headboard (photo #1). Sturdy upholstery fabric was used in this project, but any kind of fabric will work just fine. 2. Starting at one end of the headboard, pull the fabric so that it is taut across the front of the headboard, and attach the fabric to the back of the headboard (photo #2). 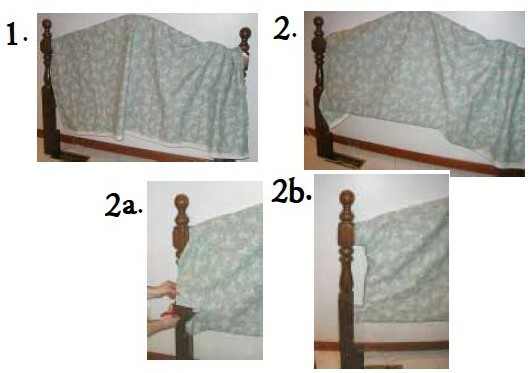 There are several ways to attach the fabric to the back of the headboard, and the method you choose will largely depend on whether the headboard will be set right up against a wall, or not. If the headboard will be flush against a wall, and you don’t care if you ruin the back of the headboard with glue, gluing with a glue gun is the easiest way to adhere the fabric to the back of the headboard. 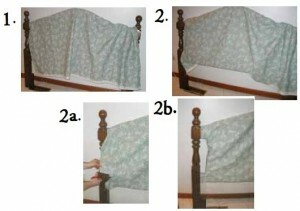 You can release lines of glue directly on the headboard and glue the fabric so that it adheres smoothly to the surface. If the back of the headboard is going to be exposed, or if you don’t want to glue the headboard, consider using small nails or – even easier – thumb tacks or push pins. 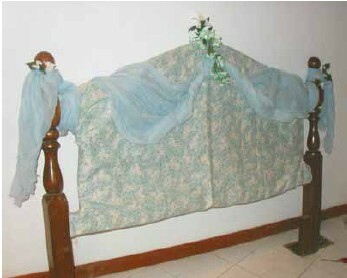 Another option for attaching the fabric to the headboard is to glue ribbons or small pieces of fabric to the edges that hang at the bottom when you drape the fabric over the headboard. Use these ribbons or fabric pieces as “ties” to tie the fabric together to close it snugly around the headboard. 4. 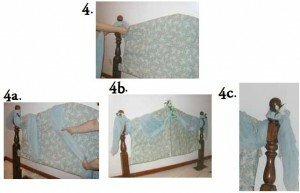 After you have covered the headboard with fabric, tie one end of about 3 yards of sheer fabric to one post (photo #4). (photo #2b). 2. 2a. 2b.